This easy Chocolate Brownies recipe is what you are looking for if you want to make the best fudge brownies. Crispy top, super fudgy center, and melting chocolate chunks. 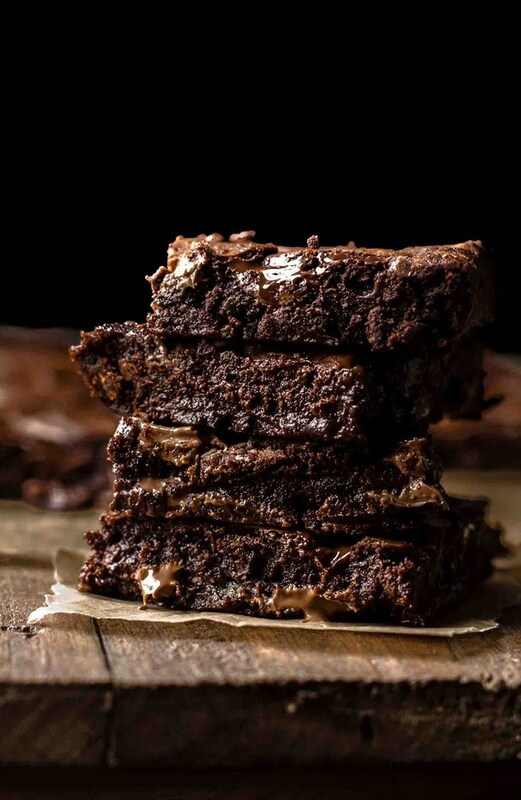 With 11 tips for making the best homemade brownies. It only takes 10 minutes of active preparation time, and you need 9 ingredients. Preheat oven to 350°F / 175°C (in the video stands 375°F but this is a typo, the 350°F are correct). Line a 9x13" baking pan with parchment paper with an overhang on the sides to easily lift the brownies out of the pan after baking. Set aside. In a large mixing bowl stir together butter, sugars, eggs, and vanilla* just until combined. Don't use a hand or stand mixer or you have too much air pockets in the batter, and this makes the brownies cakey instead of fudgy. Stir by hand with a whisk. Sift in flour, cocoa, and salt and stir just to combine. Fold in 3/4 cup of chopped chocolate. Spread evenly into prepared pan and sprinkle the remaining chocolate on top. Bake for 23-30 minutes until the brownies don't jiggle anymore and are just set to touch. A toothpick should come out dirty. Don't overbake the brownies or they are getting cakey. Because every oven is different, set the timer for 20 minutes for the first time and check every 1-2 minutes until the brownies are done. Then write down the time the brownies needed in your oven for the next time. Maybe they are perfect at the second time you bake them. I baked mine for exactly 27 minutes. Remove from oven and let cool for 10 minutes. They will keep baking in the pan. Then carefully transfer with the paper to a wire rack and let cool completely. Cut into 15 brownies (5x3) before serving. Store in an airtight container at room temperature up to 3 days. Look through the process shots to see the consistency. The photo of the toothpick test will bring clarification when it's time to remove the brownies from the oven. Reed blog post above for plenty of useful tips on how to make the best gooey brownies, how to cut them, freeze them, etc.